The film’s tone is heavy and dramatic, with very few moments of comic relief. Even still, the film has a balanced feel to it and never feels overdone. 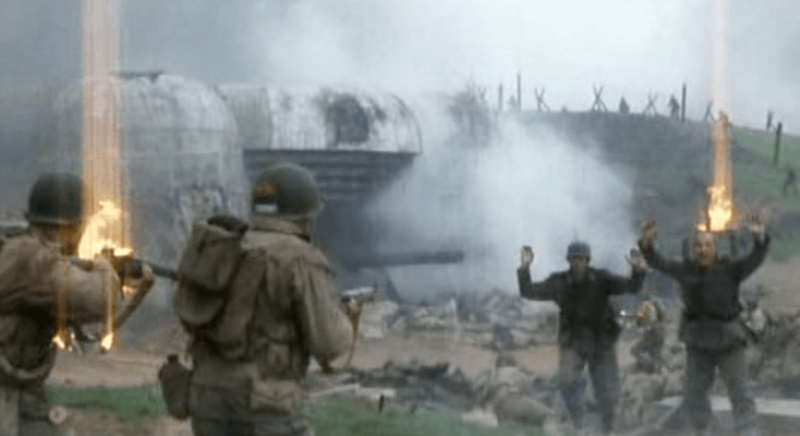 The opening Normandy invasion is one of the greatest war sequences of all time. It is intensely horrifying and entertaining all at once, succeeding in educating its viewers on just how brutal war can be. 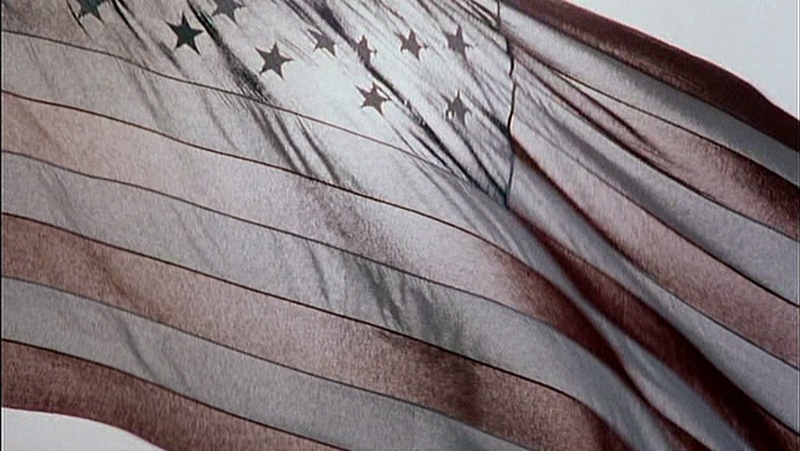 The whole battle, and much of the rest of the film, where shot with the camera’s shutter purposely modified to create a distinct look (also used in sections of Kubrick’s Full Metal Jacket). This was done to replicate the feel of a war cinematographer, as explosions and hasty film loading will generally cause such anomalies. This has since become a tired trend in any and all action movies, but here it works to create a kinetic energy that adds to the intensity. Unfortunately, these other films taking the technique should have also learned something from the editing, because Spielberg and editor Michael Kahn create one of cinema’s most memorable battle sequences, all without resorting to or relying on the now standard quick-cut editing techniques. 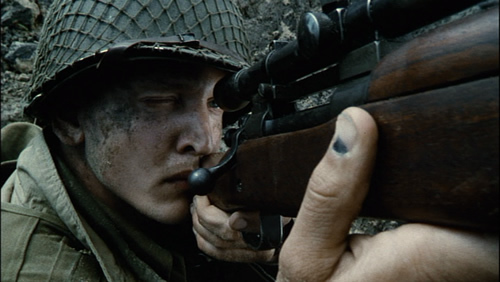 The sound of Saving Private Ryan is virtually unequaled in quality. The sounds envelope you and transport the viewer back to World War II just as much as the imagery. 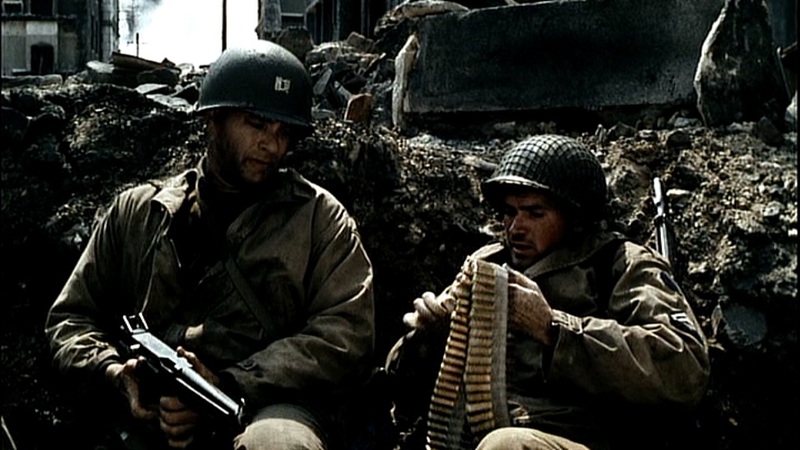 One minor chink in Saving Private Ryan‘s armor is the John Williams score. At times it is very well done and fits the on screen mood brilliantly, while at others it clashes and feels unnecessary. I would have preferred no music at these points. The music seeks to connect to a person’s emotional core during certain scenes and I was already feeling the emotions, so the music felt overdone. The power of its images are able to convey the emotion without any help. Even just recalling the images writing this, I am almost brought to tears. The music isn’t bad, but less of it would have been a welcome change. Spielberg’s goal with Saving Private Ryan is multi-layered. He has been pre-occupied with the conflict throughout his career, but Saving Private Ryan is his first true war film and can be seen as his final statement on its events (until he makes another). The focus here is on the American contribution to the war, and specifically the struggles of the everyday soldiers. There is also the motive to educate civilians on the events and the war in general, but as the film is not strictly truth-based, accurate education about World War II cannot be counted as an overall goal. 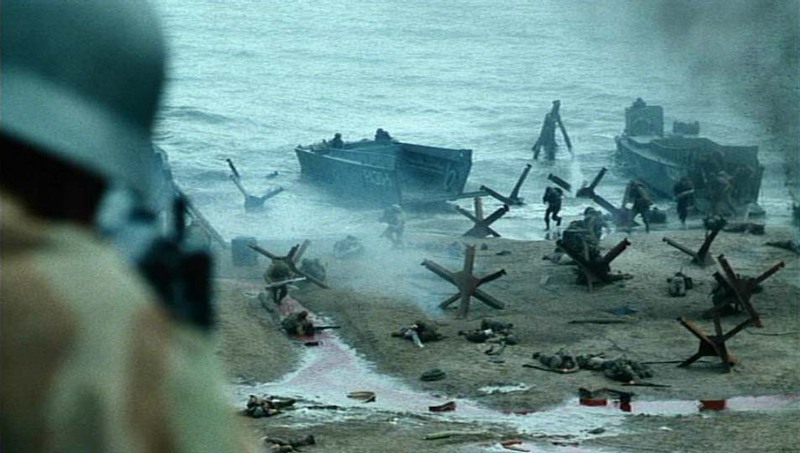 The Normandy invasion is even a highly fictionalized version of the real event, but I feel that it is accurate and true enough to the spirit of the battle and the men who fought it, to be considered above all other adaptations of the conflict. The major goal and message of the film is to provide commentary on the sacrifice of soldiers. The film communicates this message well, in subtle manners that do not ruin the atmosphere or make it seem preachy. The group of men led by Tom Hanks are sent to retrieve Pvt. Ryan from the field and send him home, as his brothers had all died and the government wished to save his mother the burden of losing all her sons. The theme of many man going to save just one comes up throughout the picture. As members of the group start dying off on the way to Ryan, one must ask themselves, no matter the circumstances, is this one man worth this? This all comes to a head in the final moments of the film when the old man visiting the war cemetery with his family is revealed to be Pvt. Ryan, and not the Tom Hanks character as we are led to believe initially. In this moment, the weight of the group’s sacrifice comes to light as this man lived a full life, fathering a thriving family and (most likely) contributing greatly to his society. Despite all his accomplishments, he is still unsure of his worth. He has lived his life in the shadow of their responsibility. I was also struck in this moment that behind every living veteran, there is a host of sacrifice and lives lost. I never really thought about how the war survivors would have to carry this burden, knowing that it just as easily could have been them. It would be a shame to waste a life that so many men give their life for. It is unsaid in the film how much Ryan’s wife knows about his war years, but here in the cemetery, Ryan can show no fear. He can hide nothing from her in these moments, confronted with the sacrificial weight of his brethren fifty years later. The film’s one major flaw is that its script doesn’t go much deeper than surface level. If you wanted to, you could watch the film completely oblivious to the story and the message of the film, only paying attention to the action sequences, and be completely satisfied. The characters are all fairly one-sided and defined by one trait such as, The Jewish soldier, the Italian soldier, the Scared soldier, the Sniper, etc. There doesn’t need to be big character arcs here, but it does feel a bit superficial at times. I only noticed this after seeing it a number of times though, so perhaps it is more my familiarity with the material than an actual shortcoming. I would recommend this to anyone learning about the battle of Normandy to get a sense of what the conflict was like. Despite shortening and simplifying it for the screen, it remains as the most visually arresting and stunning piece of war cinema ever made. It is truly incredible and should be seen by anyone that has an interest in the military or the time period. 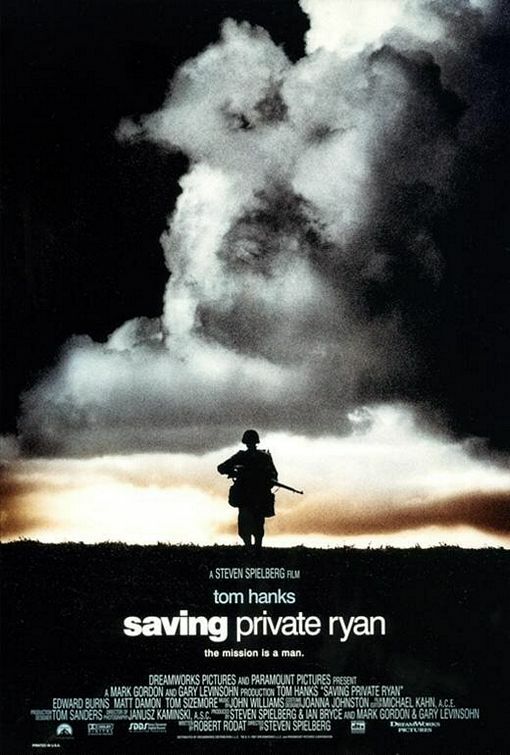 Saving Private Ryan will go down in history as one of the greatest Best Picture Oscar snubs of all-time. In fifty years, people will continue to herald this as one of the greatest films of the 1990s, and very few will remember the slight and underwhelming Shakespeare in Love. 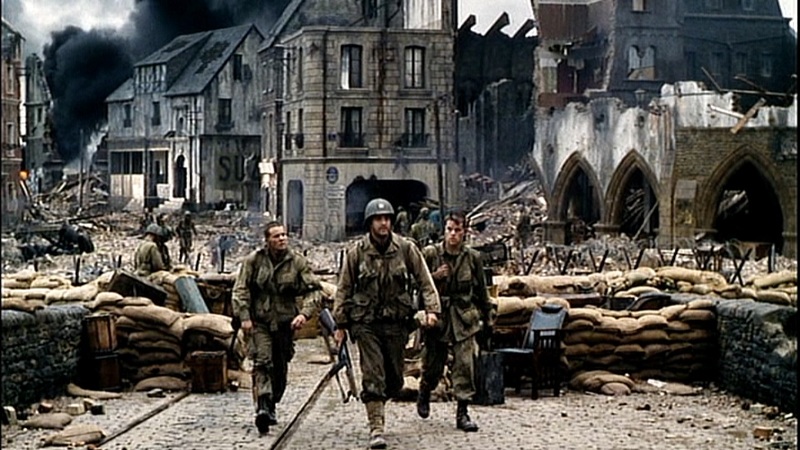 Saving Private Ryan is timeless, thanks to Spielberg’s wonderful camerawork and direction. It is truly one for the ages that won’t be dated for a very long time, if at all. If you haven’t seen it, it is a challenging film with frank, graphic violence, but it should be required viewing for all American adults. Among Spielberg’s impressive resume, Saving Private Ryan stands tall among the greatest achievements of his career. Coupled with Schindler’s List, Spielberg just about wrote the book on World War II cinema, with high-quality films depicting two different aspects of one brutal war. Coincidentally, Dan at Top 10 Films is running a Spielberg week this week, so go check it out and get your Spielberg on! « Announcing the Horrific Month of October! Glad you rediscovered this! Such a superb film on all levels of film-making. It’s true that the story doesn’t go much beyond than surface level and that the characters are fairly one-note but it doesn’t detract from the overall experience much, if at all. Yeah it really is amazingly made. It was even better than I remember it being. The story and characters definitely don’t detract overall, but I just wanted to be honest and point it out, so that I wasn’t just gushing. Shakespeare in Love’s Oscar win, another reason to despise Harvey Weinstein and his effect on Hollywood. I just re-watched this the other day and it holds up beautifully. Great review of an awesome film, my man. Personally, I’ve written a number of articles on SPR, all of which are positive, and I rank this as one of Spielberg’s most brilliant cinematic achievements. Enjoyed the read, and again, great work! Glad you liked the review. I’m with you on the SPR vs. Thin Red Line debate, but I have been wanting to rewatch TRL because I only saw it once back when it came out. I thought it was slow and pretentious, but I’d probably have a different take on it this time around. Thanks for coming by and commenting! Great review:) Yep, SPR is just one of those movies that you can watch over and over again. Spielberg could have gone over the top on it, but he didn’t. I would rate it as one of his best, along with Schindler’s List. Thanks! Definitely one of his best serious movies.